An excellent well-aged Rhum Agricole from Martinique based distillery, Trois Rivières. Trois Rivières is so called because the original estate was bordered by three rivers: Bois d'Inde, Oman and St. Pierre. The Plantation was first established way back in 1660, by French King Louis XIV’s Superintendent, Nicolas Fouquet. The distillery benefits from having perhaps one of the best locations in the world in which to grow sugar cane. Here the soil is rich in clay and magnesium, and bathed in sea water, giving the cane uniquely complex flavours. Such flavours are on show with this bottling, which has been aged for a minimum of five years in French Oak barrels. 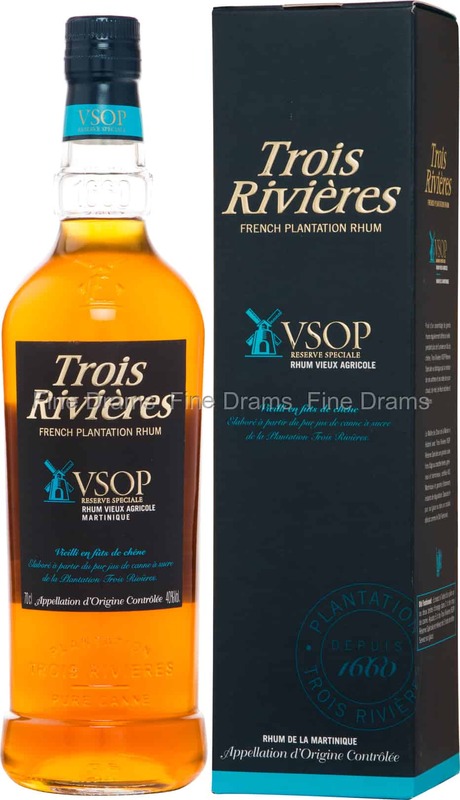 Trois Rivières VSOP delivers flavours of toffee, intense lime rind, cinnamon, cloves, red berries, mocha, dried fruits, clear honey and bananas. Whilst the intense Agricole notes are tempered by the long-aging, this means the rum enjoys an oaky complexity.